Now brawny as well as brainy, Iowa’s private colleges shine with campus upgrades and new facilities. Above: The campus of Grinnell College is changing dramatically as construction progresses on a $112 million Humanities and Social Studies Complex scheduled for completion in 2020. Four pavilions—two renovated and two new—will be linked by a central atrium. While Iowa’s three public universities get statewide attention, more than 30 private, not-for-profit colleges in Iowa draw local headlines—including announcements of major capital improvement projects on a scale that might surprise big-school alumni. 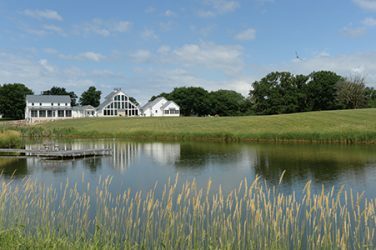 “Iowa’s private colleges are as vital and important to the people of Iowa as they have ever been, and at every one of our private colleges, there has been a lot of new building construction in the last five years,” says Gary Steinke, president of the Iowa Association of Independent Colleges and Universities. Grinnell’s Humanities and Social Studies Complex will enclose 200,000 square feet, including 39 classrooms and labs, 145 faculty offices, research spaces and a cafe. Three major campus upgrades with a budget of $140 million make up just Phase 1 of a three-phase, 20- to 25-year strategy of campus investment under Grinnell College’s Campus Master Plan. 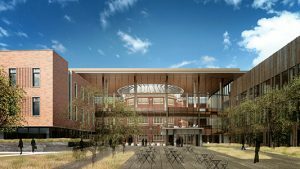 Work on a $113 million Humanities and Social Studies Complex includes new construction, plus renovation and expansion of the school’s iconic Alumni Recitation Hall and Carnegie Hall. Four pavilions—two renovated and two new—will be joined by a central atrium. Spanning more than 200,000 square feet, the complex will include 39 classrooms and inquiry labs, 145 faculty offices, research spaces, a cafe, and centers for data analysis and for global studies. Completion is scheduled for 2020. 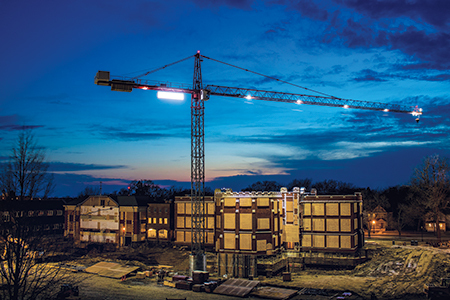 “It is precisely because of the importance of the humanities to the liberal arts education that we are embarking on one of the largest building projects in the history of Grinnell,” says President Raynard S. Kington. The complex will complement Grinnell’s existing center for the sciences, he adds. A two-story Admission and Financial Aid Center is planned to serve prospective students and their families. Styled to bridge the classic campus with the residential neighborhood, the $12 million, 18,250-square-foot facility will feature a covered walkway from a new parking lot to the front door. Planned completion date is spring 2019. Grinnell College has also created a landscape master plan that includes a redesigned quadrangle, plazas, other gathering spaces and tree-lined pathways. The $14 million project focuses on sustainability elements such as permeable pavers, bioswales (depressions that collect storm water and send it back into the aquifer instead of into storm sewers), and prairie-type native plantings to support management of storm water runoff, which will be used for flushing toilets and for irrigation. The initial landscaping elements are expected to be finished by November 2019, and the balance of the landscape plan will be implemented in future phases. Morningside College’s “academic village” includes a new classroom building, a new advising center and the remodeled Hickman-Johnson-Furrow Learning Center. 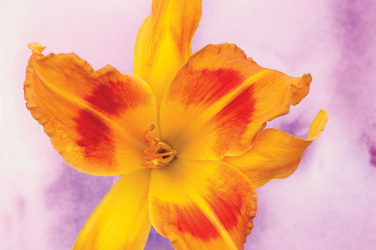 In 2012, Morningside College in Sioux City launched the most ambitious fundraising effort in its history, called “Vision 2020: Transformation II,” which raised money not only for scholarships and the college’s endowment, but also for dramatic facilities improvements. 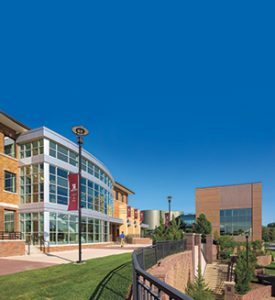 Today, Morningside students enjoy a $13 million “academic village” that includes a new classroom building, a new advising center and the remodeled Hickman-Johnson-Furrow Learning Center. “The academic village project is part of our ongoing transformation of the Morningside campus and the educational experiences for our students,” says Morningside President John Reynders. Morningside’s new three-story Buhler Rohlfs Hall offers state-of-the-art technology for students enrolled in the School of Education and the Applied Agricultural and Food Studies Program. Nursing students engage in lifelike patient-care situations in rooms that mimic hospital settings. High-fidelity patient simulators give students practice making diagnoses and care decisions in a safe, controlled environment. The two-story Krone Advising Center primarily serves first-year students and those undecided on a major. Updating Morningside’s library included a new glass-enclosed main entrance that faces the $4.2 million pedestrian mall and greenspace, dedicated in 2012 in the heart of the 68-acre campus. The library’s second floor was converted into a study lounge and areas for academic support services and the college’s writing center. The $14 million renovation of an 86-year-old dorm, Morningside’s largest housing unit, included numerous upgrades. The Vision 2020 campaign also funded the $1.5 million renovation of Eppley Auditorium. Outside the auditorium, a 12-foot glass canopy was added over the main entrance, and landscaping and parking areas were upgraded. On the Morningside campus in Sioux City, the Krone Advising Center helps students select and prepare for their majors. 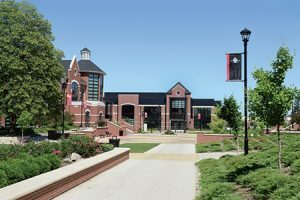 Leaders at Grand View University in Des Moines also use “transformation” to describe changes that have nearly doubled the footprint of its campus. Renovation and expansion of the Student Center was completed in 2015. 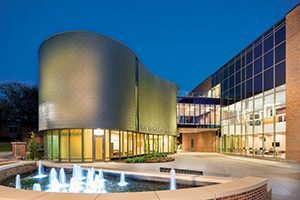 It houses the communication and theater departments, student dining, academic and career success centers, the bookstore, student services and recreation, the Viking Theatre, and a large multipurpose performance area. 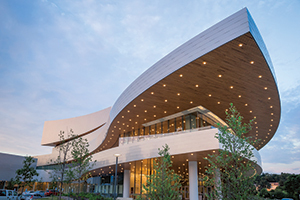 Expansion of Grandview’s Student Center encompassed the communication and theater departments, student dining, the bookstore, the Viking Theatre and a multipurpose performance area. The building also is intended to be used by organizations and groups throughout Des Moines. “To see the gathering space pull the campus community together was a great way to finish off this long-term campus master plan,” Henning says. Other projects that were part of the master plan included four new student residences and the construction of a 92,000-square-foot wellness center. Sisam Arena also was renovated. The Rasmussen Center for Community Advancement Professions anchors various academic departments, as well as contains classrooms, art studios, computer labs and offices. A 156-foot-long skywalk passing over East 14th Street connects the Rasmussen Center to the Student Center.